We’ve all played games when we were kids as a way to have some fun and kill some time. Little did we know that a time would come when playing games would turn into a necessity to keep our brains active. For some of us, this time has already come as we have resorted to playing any and all memory games for adults that we can get our grubby little hands on. We certainly can’t be the only ones in need of a memory helping handout. So, this one’s for you if you have found yourself forgetting why you entered a room or find yourself searching for your keys as you struggle to remember which Kardashian is which. Better write some of these memory games down just in case you have a brain fart and forget! Sharpen your pencil because it’s time to crack the mystery that is Sudoku. You’ll give your brain a good workout as you navigate all of those blank boxes begging to be filled in with the appropriate numbers needed to complete the puzzle. Just make sure you have an eraser handy because there will be a lot of erasing going on if you’re anything like me. Sudoku is a great way to improve your memory, logic and problem solving abilities as you simultaneously increase your ability to concentrate and learn to make snappy decisions. No childhood was complete without a knock down drag out game of Simon. Oh come on, you know you loved slapping those color pads each time “Simon’s” robotic voice told you to. However, you probably didn’t know that you’d have to start playing it again as an adult in an attempt to keep your memory fresh. It doesn’t take long for “Simon” to accept your challenge and give your short-term memory (and coordination) quite the workout. The game goes from having to tap one color block to quickly having to hit multiple color blocks in a certain sequence all while using your memory recall to remember what “Simon” told you to do. By the time your three strikes are up, you’re probably going to be panting, sweating and mentally exhausted, but you’ll have probably given your working memory a serious boost. Mental puzzles are great games that are totally acceptable for adults to take part in, especially when your doing it in the name of memory improvement. For example, you can’t go wrong with mental puzzles like word finds and crossword puzzles as a way to stimulate your cranium. Studies show a significant improvement in memory and cognitive functioning as a result of getting to work on challenging crossword puzzles and/or word searches. Plus, you’ll also be improve your language skills as you try to fill in those nagging blank boxes and hunt for the remaining words on the list to the left. If that’s not enough to get you to pick up a crossword puzzle, there’s new research showing that word searches and crossword puzzles are prone to decreasing the odds of developing Alzheimer’s and other memory deteriorating diseases. A study from the Yeshiva University in New York found this to be true in subjects who worked on these mental activities each week for four or more hours. It’s time to channel your inner Bobby Fisher and take advantage of all of the brainy benefits associated with a good game of chess. Apparently, there’s far more to this game than moving around a faux army and getting to take your opponents queen while shouting “checkmate” upon your victory. Chess has actually been found to have a gaggle of benefits for your brain. We commonly associate chess with its super smart (maybe a little nerdy) players, and it’s for good reason: chess is indeed known for having a significant impact on IQ scores. One study even showed the IQ’s of 4,000 students to majorly increase after only four months of chess play. Moving around your rooks, knights and queens really makes your brain work hard in both hemispheres, which is not all that common on a regular basis. Both chess experts and beginners are said to have much quicker reaction times to inquiries about things related to chess positions due both sides of their brains working together. We can see that playing chess is a pretty intense workout for your brain and that’s just perfect given that it works very much like a muscle. The increase in IQ and use of both hemispheres eventually leads you to an increase in creativity and most importantly an improved memory. After all, you do have to tap into your memory when facing an opponent in order to recall what moves were made and which ones you should use based on prior success. 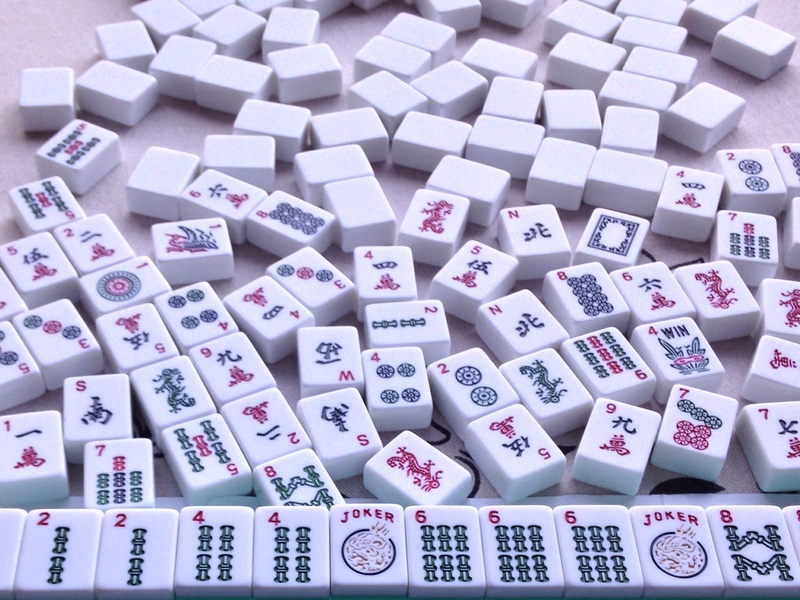 Mahjong is a super fun tile game that originated in China in the late 1800’s. It is a game of strategy and takes a good bit of skill to truly master. The ultimate goal when playing Mahjong is to build as many sets of three with your tiles as possible with as few remaining tiles on hand if you’re unable to play them all in your sets. Think of it like a much more complicated version of the card game Rummy. There is a lot more going on than just trying to find matching tiles during a heated Mahjong game, according to researchers. Mahjong requires its players to tap into their concentration banks, problem solving abilities and utilize their intelligence, which has been found to work wonders on memory, increase cognitive performance and reduce dementia. Another really interesting benefit to your memory from playing Mahjong comes in the form of an improved verbal memory. The reason this is so interesting is because verbal memory “refers to memory of words and other abstractions involving language,” and this is a game that doesn’t require its players to read or speak at all. However, players are still found to have a pretty significant improvement in their verbal memory despite using tiles that may be in a different language and not really needing to read or speak during the entire game. Interesting, huh? You don’t have to buy a game or go online to play one in order to work up a mental sweat and improve your memory. There are some super simple brain games for you to play with some of the random stuff you have hanging around your house and while you’re going about your every day life. Give these DIY memory games a try! Memorize a list: Make a list for the grocery store, a to-do list or even a list of phone numbers. All you have to do now is read it over and over again until it is committed to memory. Then you can test your memorization skills during a trip to the store, when you’re ready to check something else off your to-do list or when you need to give someone a ring. Draw a map: Test your memory by taking a mental snapshot and drawing a map of a place or room you were recently in and is not one you’re super familiar with. Try to remember where furniture was, what color the walls were, the location of painting and anything else you can think of. Drawing a map is a great way to test your memory recall and observation skills. Mental math: We know doing math for recreational purposes isn’t likely to be very high on your list of priorities, but give it a try anyway. You can work your memory by using those dusty old mental math skills instead of a calculator when you’re paying bills or when getting change back from a purchase. Learn a language: Learning a new language can be pretty challenging for certain. However, it does tap into your memory resources in a new way and is noted as an excellent way to enhance brain function and improve memory. Sing along: Don’t waste all those minutes spent in the car on the way to work or school anymore. Instead, crank up the tunes on the radio and sing along. The more you listen and attempt to sing the lyrics, the more you will actually remember them. Your memory will start to improve in no time even if you sound more like a drowning cat than Beyonce while belting out the lyrics.